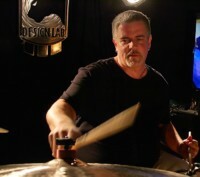 Born as the son of a drummer, Chris Turner not only had rhythm in his genes and the constant support of a musical family, but also he grew up in an environment full of musicians and jam sessions. 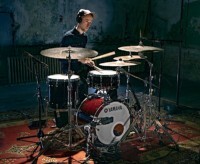 After seeing his dad play at a concert at the age of four Chris’ decision was clear: I’m gonna be a drummer. 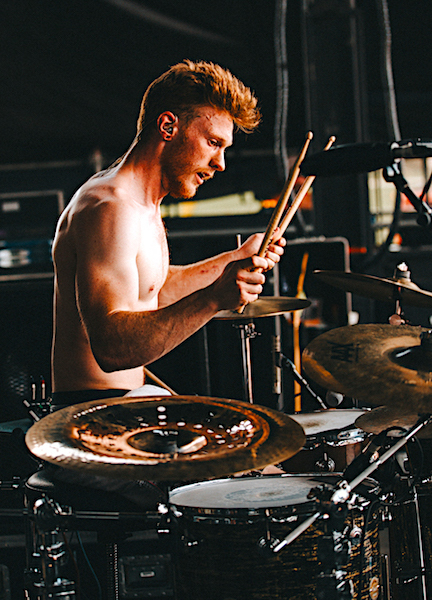 After aquiring a solid drumming foundation, Turner’s attention was drawn towards the intriguing and challenging drum parts of Metal. 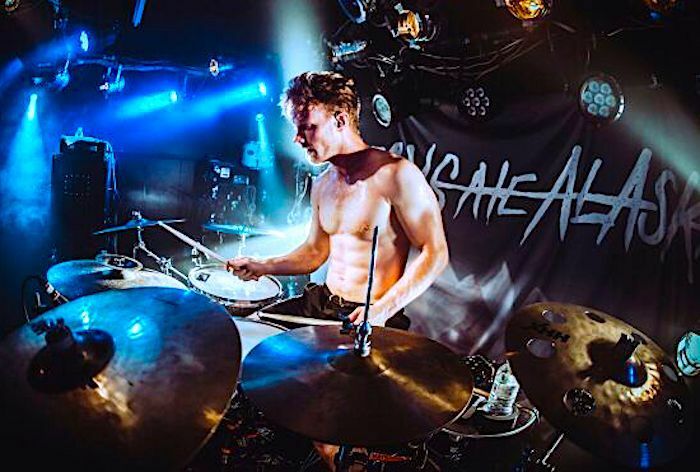 Today Chris is known as one of the most unique, powerful and tight drummers on the circuit, providing a rock solid backbeat to his Metalcore band ‘Oceans Ate Alaska’. His frantic and aggressive style is only emphasised by Chris’ “in-the-zone-death-stare” which earned him the rather fitting nickname ‘The Robot’. 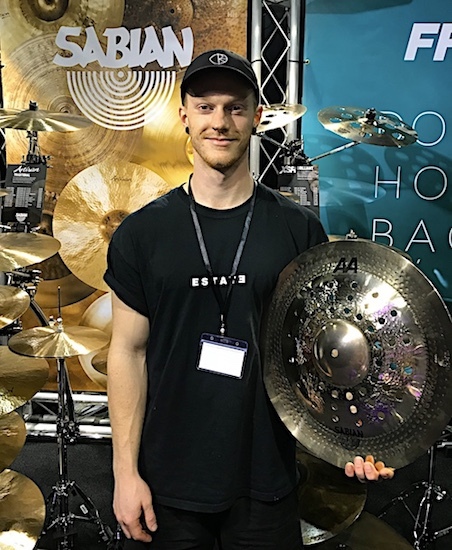 I caught up with Chris at the UK Drum Show to chat about growing up as the son of a drummer, his way into producing and his passion for extreme sports. Your dad was a drummer. Has he been a big influence on your musical upbringing? He was. He played fusioney / funk type stuff and was really solid. This was long before click tracks and recording to the grid. 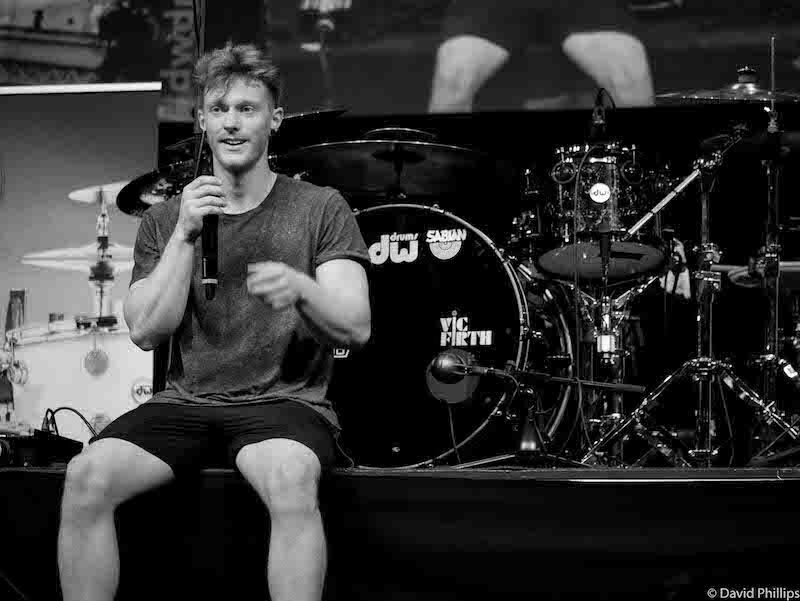 Back then people just wanted a solid drummer who could keep 4-on-the-floor for 3 minutes and he was exactly that – a groove drummer, which is funny because it’s not the direction I’ve gone into myself. He was amazing and he never pushed me to play, he just did his thing. I went to see him play at a festival when I was 4 years old and was just blown away. I remember running over to him the minute he got off stage and asked him to show me how to do this. Obviously it’s different learning from a family member because you’re at home, it’s causal and the discipline is different; so at some point my dad decided to get me lessons at the drum centre which was in a local music shop. I stopped having lessons after about 3 years there when I was 10. So you grew up surrounded by musicians? Absolutely. It was great. My god father was the vocalist in my dad’s band so he was constantly around the house and there were always people jamming. Every time we had a BBQ there would be a kit set up and everyone would go up and have a play. My sister and my mum also play instruments. It was really nice to grow up in that environment. Not to mention one of my all-time best friends Nick. He’s a jazz guy and studied at the Birmingham Conservatoire and lives two doors down from me. We still did ‘normal’ kids things like go playing in fields and having fires, but we also spent a lot of time drumming together. So I really was surrounded by musicians pretty much from day one. Where did the passion for Metal come from then? My dad and I would always listen to music by Sting, The Police, Dave Matthews Band and stuff like that. Never anything heavy, but when I started growing up I discovered rock and liked Linkin Park. Then I remember one day I heard a band called ‘Between The Buried And Me’ who are kind of a technical metal band. I was just blown away and couldn’t get my head around what the drummer was doing. He did stuff I have never heard. That was it, I just loved it. Then the vocals came in with the screaming and I just turned it off. It really took me a couple of attempts to get into the screaming. It wasn’t music that any of my friends were into or something like that. I was really only drawn into it by the drumming. The blast beats and odd time signature just fascinated me and I went down the rabbit hole. From then on it just got heavier and heavier. I got into a band called ‘Despised Icon’ who are the definition of ridiculous metal drumming. I guess I then created my own little fusion from what I grew up with and the metal that I played. That’s where I get my influences from. Although now being know as the drummer of a metal band, you don’t classify yourself as a ‘metal’ drummer. Apart from those few bands that got me into the genre I never really idolised metal drummers, so I don’t even have a favourite metal drummer. My favourite drummers are Chris Coleman, the gospel chops scene, Eric Harland… they are the kind of drummers that influence me. When I’m at home I don’t listen to metal ever. I listen to a lot of jazz, electronic and chill out music. All of it is very mellow. So I don’t see myself as a metal drummer. I don’t get behind a kit at home and just play a blast beat. I sit down and groove it out and maybe jam along to some hip hop tracks. I spent a lot of time learning the foundations and certainly have other things in my toolbox. There is brush work on our last album for example. How many metal bands have that? Do you actively use these foundations in the writing process nowadays or do they just come out accidentally? It will never be accidental. It will be more a matter of a song dynamically going in a certain direction that leans to incorporating some of those things. It will always be intentional. Our music generally is very intricate and accurate. Everything has been planned very precisely so it wouldn’t really be an accident – but I also don’t try to force things onto it. I read that you see practise more as a workout rather than practise? It depends on what I’m practising. 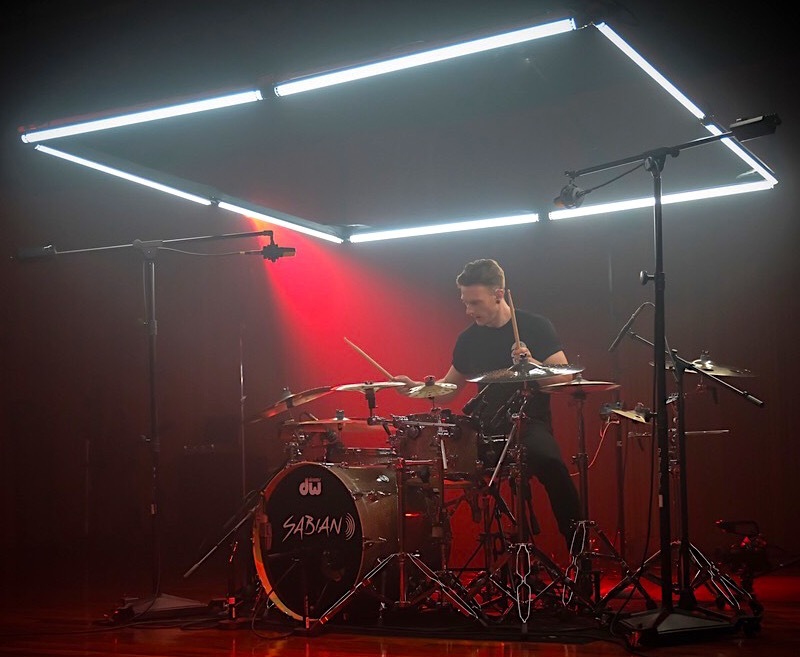 One thing I absolutely hate is getting an idea in my head, being really excited about it and then getting behind the kit and I physically can’t do it. Whether it be a coordination battle, a stamina battle or a speed battle – it really frustrates me if I can’t play it. That’s when I told myself that I don’t want to be restricted or held back and decided to train like as if it’s an athletic sport, simply so I can play whatever idea pops into my head. I like to take something out of a musical context, train it athletically and then put it back into a musical context where I don’t need to hit maximum speed, but it’s there if I want it. Especially with the kick drumming. I would train stupid BPM for 90 seconds. You would never use that but when I’ve got 8 fast bars in a song at some point, I don’t have to struggle through it. So yes, I do view practise for things like that as ‘training’ but that’s not my only practise. 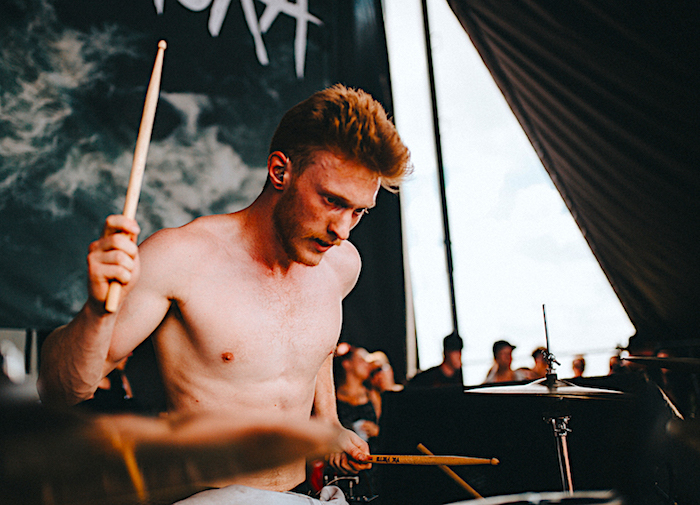 Oceans Ate Alaska is obviously your main gig now. Was that the first project you were involved in that took off? Well, it was actually the first band I ever started. It was under a different name back then and I was still at school; I was probably 14. We went through a few different members and did the whole local band thing where you haven’t got a clue and just embarrass yourself – but you’ve gotta learn that. After a while when we knew what we were doing and got some contacts in the local area, we decided to take it seriously. That’s when we changed the name to Oceans Ate Alaska. Since then I have done a lot of things: I write for other bands, I produce, performed on other records and so on – but it was actually that little school band that got me here. You’re the main writer for the band? I never want to take away from what the others do, that wouldn’t be right or fair. I do all the pre-production and I do engineer everything when it comes to the recording so everything is quite heavily influenced by me – especially with it being quite a drum centred band. We’re quite a rhythmical band and I write all of the rhythms. So yes, I definitely have a very heavy influence on everything we write but it doesn’t mean that our guitarist won’t show up with an idea that’s awesome and gets used straight away. It’s definitely still a collective effort but I call myself a primary composer. What is the process of writing? Seeing as the music is quite complicated, do you sit down with pen and paper? I did back in the day. That was before learning ProTools. Now it’s all on the computer. Strictly just for composing though. After that I couldn’t stay far enough away from MIDI, triggers or anything fake. Out last record ‘Hikari’ doesn’t have a single part of MIDI in it. Everything is real: no triggers, no samples… I like natural audio. But yes, when we are composing everything is just built. I’ll program drum parts, we’ll track guitar parts, build them up and create harmonies with pitch shifters and stuff like that. Everything is digitally built but that’s how we get all those fine details really accurate. Sometimes I even write drum parts I can’t actually play because I like the challenge. I know huge drum kits are a bit cliché but you’re playing a fairly small kit for a metal band. Is that just to challenge yourself or is it simply all you need? That’s all I need. If I needed something else I’d put it there. If I don’t need it I’m not wasting my time setting it up. I really don’t like setting up and tearing it down because it’s just the same thing every day. So if I don’t have to have an additional stand, believe me, it’s not coming with me. I just don’t feel the need for it and I would feel silly. Especially if something goes wrong or we’re having a bad show I would feel embarrassed to have all this stuff and not rock it. I just bring my kit and own it – and I feel good doing that. In my videos I use bigger set ups because it’s more visually pleasing for people but live I can’t be bothered. You mentioned you’re strictly against triggers? Strictly no triggers. Not live, not on record, never! All the power is coming from my legs. People are trying to catch me out on this saying we used triggers on our first album, and it’s true, purely because of budget. We weren’t signed and it was completely self funded (we actually took out a loan to do the album). You can’t expect to have the nicest equipment, the best drum room and the time to tweak for days. It’s just not possible on a small budget. We had three days to smash the drums out so we decided to replace them afterwards and focus to get the cymbals right. On our last record we were signed and had a proper budget. I spent a week in the studio, changed cymbals for every song (sometimes even halfway through a song), I retuned the entire kit for the jazz parts, moved it around in the room and so on. We were now able to do that, whereas before it just wasn’t possible. So yes, we did use triggers on the first album. Not because I wanted it but because we had to. I’ve never used them live though and now that we’re signed I don’t use them on albums. I couldn’t be more against it. It’s just not drumming to me. I don’t really think it’s cheating but the one shot kick trigger sounds the exact same every time, so you’re stealing all the feeling. If I play to kicks with my right foot back to back, they’ll both be different and you can never repeat that. That’s what you want, that’s the magic. and that’s what makes you stand out from every other band who use the same kick trigger from the same sample bank. 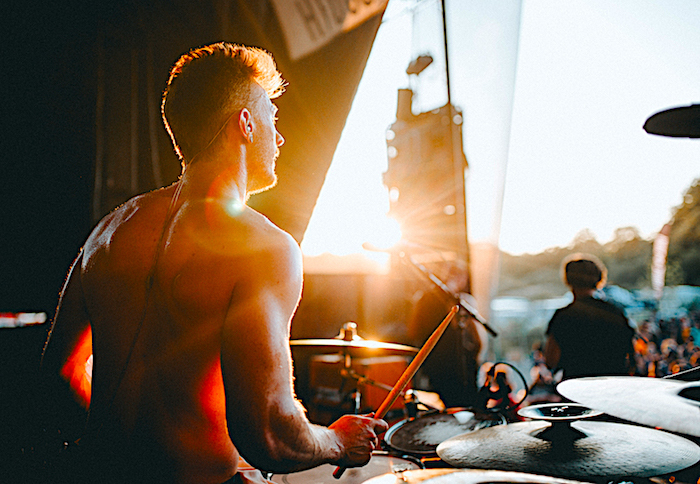 I don’t want to sound like them, I want the sound of my drums. That also means every show is slightly different which makes it more interesting for the audience. You are using click tracks though. Absolutely, yes. They’re all programmed. Actually our whole set is programmed from start to finish – even the gaps between songs. It gets really intense with us. It started out as a joke. On the first record I thought it was funny to have one of the tempos with a decimal point making it 120.5 bpm. Then for the second album I just made all the tempos ridiculous. The first song I wrote for it, the tempo actually is my phone number. It’s the first 3 digits of my number, than a point, then the other 7 digits. As well as that that are a lot of tempo changes, a lot of metric modulations and a lot of bars of 15/16 which just means all the click tracks have to be preprogrammed and I have to stick with it. If I fall out once, the whole one hour set is out because it’s all one click track. So yes, definitely everything to the click. I’m religious to my click. Yes, we use backing tracks too. The most important thing for me is to never have awkward silence. I always hated that when watching a band and once they finish a song everyone is just waiting around for the next one. So with my production background I write unique links between songs. It’s usually just a 30-40 second piece that would maybe have a key change to link up songs. That’s the main reason for our backing tracks. But then we also have little reverses or a violin part or something like that on there. Nothing over the top though. You have mentioned the producing already and you have a studio at home. Was that always been a passion? Well, I’ve never learned it but it all goes back to our first record where we had the small budget. We flew ourselves out to Detroit to record but ran out of time and didn’t manage to record bass. Literally throughout the entire time we were there I sat next to the producer, watched everything he did and asked lots of questions. By the end of it he even let me have a bit of a go on Pro Tools. He said: “You know what Chris, we don’t have time to record bass but go home, get Pro Tools, update your rig, get a high quality interface and track bass.”. I started of so slow trying to edit recordings and figure out shortcuts, but after 2 songs I was flying. By the end of that I knew how to engineer. Then when writing our second album ‘Hikari’ I did all the pre-production and then actually did all the recording as well. Apart from drums of course. I now even have other bands coming to me for recording. I got dropped in the deep end and it worked. Outside of music your doing a lot of extreme sports. Rock climbing is one of your passions? Absolutely. That was actually my full time job before music took over. Of course taking the band route like I did doesn’t make for a career immediately. You have to play for peanuts and do the hard work. So while we were doing that, we all worked jobs as well to try and fund it. I was a rock climbing instructor and route setter. I still climb all the time. I slackline, skateboard… I love it. And you’re not worries about injuries? I’m not worried about calluses but I am worried about tendon injuries in my fingers and forearms. Because I was in the industry I don’t go out with sketchy people though. Everyone I go out with have had the same climbing and rescue training as me, so we’re very safe climbers. We look after each other and I’m not worried about breaking a leg or an arm at all. The only thing I worry about is pushing myself too far snapping a pulley in my finger – which I have done and that’s a long and painful recovery. Weirdly enough, no tours are in the pipeline right now! Instead, I’m staying home and working on Oceans third full length album, and I’m also writing and recording the upcoming I Am Abomination record with my good friend Nick Sampson – so lots of sick new material is to be expected in 2019! Thanks a lot for your time Chris!